Monday night JJ and I had a bit of a scare. JJ went looking for his beloved cat, Luke, and couldn’t find him so he asked me to help search. I reminded JJ that many times cats find odd little places to sleep and we search and search for them without success–and then suddenly they appear. But I knew JJ was worried so I called “Here, Kitty, Kitty” and all the cats appeared except Luke. We double-checked that all the doors and windows were secure which means he couldn’t have gotten out. No Luke. Then I remembered that a few hours earlier I had held the front door open briefly…so I told JJ to make sure Luke hadn’t somehow gotten trapped between the screen door and the storm door. He opened the door and there was Luke…OUTSIDE the house looking in. He must have snuck (or teleported) through the door when I had it open. Luke had always been an inside cat from the time he was a tiny kitten. We shuddered to think of everything that could have happened to him: lost in the forest, eaten by coyotes. Yikes! We were weak with relief that he was ok. 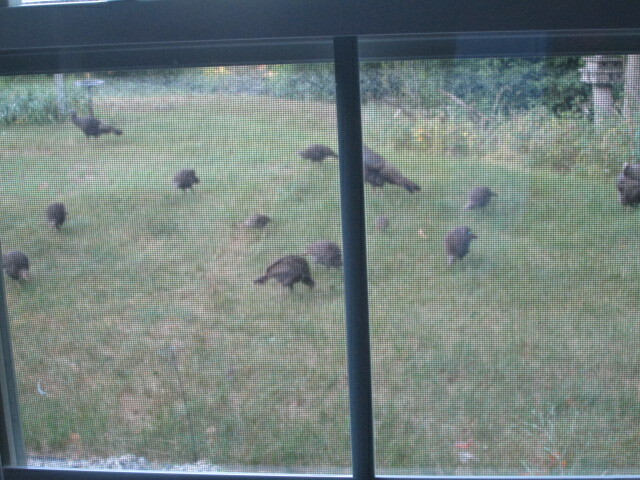 Yesterday morning I glanced out of the window and saw a turkey family walk across the yard with their little ones. These babies were younger than the ones I saw the other day. I got out my camera and took pictures and videos of them traveling across the grass. Near the edge of the forest, they merged with the family with older babies. They came very close to the house and then went back across the yard and out of sight around the cars. Later in the afternoon, about the time for JJ to arrive home from work, I got a call from him. He whispered that he had stopped the car at the bottom of the driveway when he saw a large flock of turkeys. He excitedly told me that they had surrounded him. He took a video of the turkeys with his smart phone, but I don’t think he’s uploaded it yet. This morning I got out of bed and opened the curtain a little bit, hoping to see deer in the back yard. I was thrilled when I spotted a doe and her fawn grazing. I watched them until they went out of sight around the house, and then I grabbed my camera and went into our library to video them. We never get tired of watching the wildlife in our yard. I would love to set up a trail cam (which films only when there is movement) so I can see what other wildlife might be making an appearance on our property. Foxes? Coyotes? Wolves? 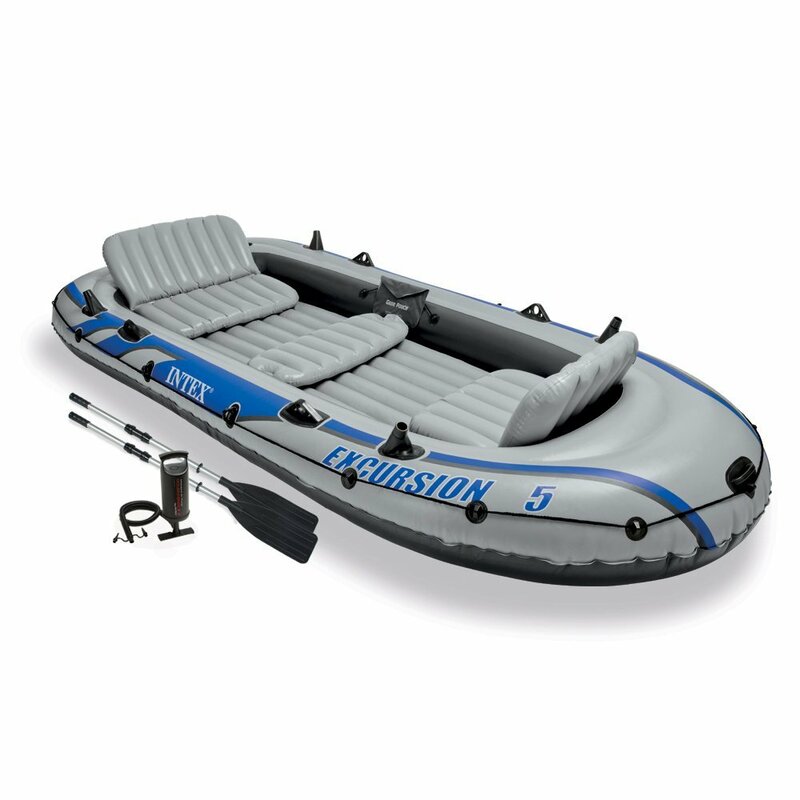 Yesterday the inflatable boat arrived from Amazon. We opened the box this morning. I immediately made doors and holes in the large box so the cats could play in it. Then I said, “Oops! I probably shouldn’t have done that in case there’s a problem with the boat and we have to return it.” Oh, well. JJ wanted to take the boat out on a lake today since he didn’t have to work. I was a bit concerned about taking it out on a big lake because the three life jackets I had ordered aren’t scheduled to arrive until next week. However, we decided that it wouldn’t be a bad idea to get two extra life jackets–since, after all, the boat seats five and someday we might have guests. JJ said that the store he works at sold life jackets, so we said goodbye to EJ (who had to work) and went off on an adventure. At the store, JJ introduced me to his manager by telling him “This is my Mom. She speaks Klingon.” I don’t really know Klingon. I only know one word, which most of the time I forget: NugneH. It is a Klingon greeting which means “What do you want?” Klingons don’t say “Hello.” They are not polite. I also know one Klingon insult: “Your Mother has a smooth forehead.” Sometimes when JJ and I have argued, I have shouted, “Oh yeah? Well your Mother has a smooth forehead!” JJ always replies, “You are my Mother and you DO have a smooth forehead.” I say, “I know. So it’s not much of an insult, is it?” and we both laugh. Anyway, we had fun shopping at JJ’s store. We bought two life jackets, sunblock, a jug of water, and a battery operated air pump thingy to inflate the boat quickly. The boat had come with a bicycle pump type of thing and we weren’t sure that would inflate the boat quickly enough. We were able to use JJ’s employee discount for the purchases, which was nice. We looked for a water-proof case for my cellphone because JJ insisted I needed to bring my cellphone on the boat with us in case we got into trouble and needed rescuing. I didn’t want my phone to get wet and ruined. We couldn’t find any waterproof cases at his store, so we stopped at a Dollar General store later and I got a plastic sports water bottle. I screwed off the lid and put my cellphone inside as a cheap and “better than nothing” waterproof case. We knew of only one place where we could launch our boat. On the way, we saw a sign pointing toward a boat launch so we turned and followed it, to the dismay of Viki, our GPS. It led to a boat launch at a river and there were a lot of power boats there, so we decided to go on to our original destination. That place had an even busier boat launch. I wasn’t sure about the etiquette of launching an inflatable boat at a boat launch, and I wasn’t crazy about trying to paddle our boat among power boats. I was also a bit concerned that our boat would be too much for us to handle. I suggested to JJ that maybe it would be better to do this another day when his Dad was with us, but JJ declared, “No! I want to do this today!” and I wanted to give him good experiences and an outlet for his emotions, which are affected by cancer. I remembered the quiet beach in Storybrooke where we had taken Danny and suggested we go there, even though it kind of scared me to be on such a large lake. But, then, the smallest lakes around here are many times bigger than the biggest lakes back where we used to live. At the beach at Storybrooke, we carried the heavy bag containing the boat down the path to the sandy beach. We also carried the paddles, air pumps, sunblock, and jug of water with us. We got out the new air pump and quickly discovered that it needed to be charged before we used it so I took it to the car to begin charging while JJ used the bicycle pump that came with the boat. It filled the boat quite quickly, but then JJ pumped it too vigorously and it came apart. Oops. So we carried the partially inflated boat back to the car where JJ thought we could use the battery operated pump while it was charging. We found out that it can’t be used while it’s charging. I suggested maybe we give up, but JJ asked that I give him time to problem solve. Ok. I was able to get the manual pump working so we (mostly JJ) inflated the boat and then we carried everything back to the beach. Both of us were wearing jeans–JJ because he couldn’t find any shorts or swimming trunks that fit him and me because I hate wearing shorts. I had brought shorts with me hoping to change into them, but there was no place to change. So while everyone else at the beach was wearing swimming suits and shorts, we went boating in jeans. We took off our shoes, rolled up our jeans, and got into the boat. The lake was very large, and there were lots of waves, and I felt small in the boat. Fortunately the wind and waves were pushing us towards the shore instead of out into the lake. Before we could get settled, the boat almost bumped into a man floating in an inflatable chair. We shouted, “Sorry!” and he gently pushed us off, and then we got into the groove of rowing, more or less. I unscrewed the sports water bottle to get my phone to take a picture of JJ, but he yelled, “Row! Row!” so I put it away and began to row. We had to row hard to even stay where we were. If we stopped, we drifted toward a small group of swimmers. I had planned to put on sunblock once we were on the boat but there was no time. We rowed and rowed and laughed and had a lot of fun. But we have not had such exercise in a long time and I tired quickly so we stayed out only a short time before row, row, rowing to shore. We dragged the boat out of the water, carried it up the path to the car, and deflated it. I took the following video while JJ was deflating the boat. He wanted me to sit on the boat to speed its deflating, but I first took the video before going back to help him. I thought that if anyone was watching us, we would have appeared very comedic, but this was our first time with the boat and I think that with practice we will get better at inflating it. JJ has more experience with rowing because of his scout troop and he was not impressed with my rowing skills. “I will have to teach you,” he said. Then he said he thought it would be better to have at least three people in the boat. “We also need to get another set of oars,” he said. “Then I can row, and Dad can row, and you can just sit there.” I exclaimed happily, “Oh! I can beat the slave drum to set the tempo while you guys row!” Hey, you know, you just have to make the best of things! We were really tired by the time we we got the boat packed away, but we had had a lot of fun. 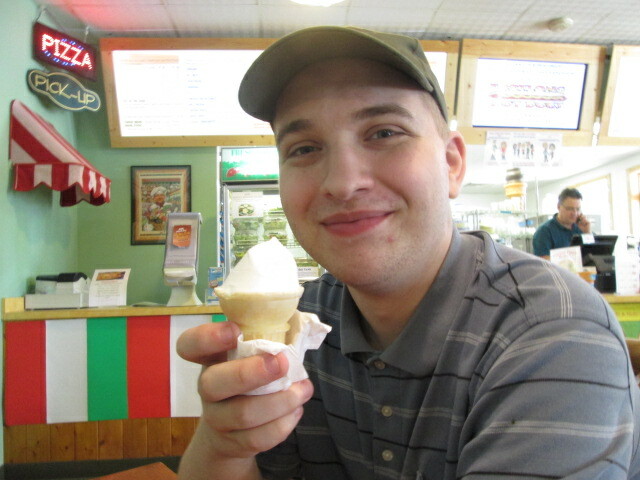 We stopped at a pizzeria place on the way out of town and ate frozen yogart cones while we wanted for the pizza to get done. Then we drove home, spread the deflated boat out in the sun to dry, and went inside to eat the pizza. It was totally delicious! I think we will go back to that pizzeria. Yay for a good day with fun and pizza!